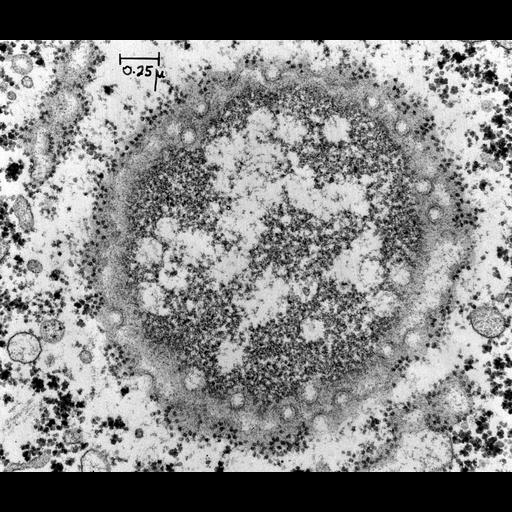 Transmission electron micrograph of rat liver cell showing a grazing section through the nuclear envelope and illustrating the high density of nuclear pores in cells from a 1 day old animal. The cytoplasm contains many small, darkly staining glycogen particles. Image made available by James D. Jamieson and the Department of Cell Biology, Yale University School of Medicine. Original 3.25 in. x 4 in. lantern slides were scanned at 600dpi. Original Magnification: x24,000.